What's Alan Watching? : The Office, "Mafia": Where were the heads of the Five Families? The Office, "Mafia": Where were the heads of the Five Families? Jim and Pam's wedding certainly didn't ruin "The Office," but their honeymoon led to a real dud of an episode. Much like Oscar, "The Office" really, really needs the Coalition of Reason to be at full strength. Michael, Dwight and Andy are all very funny characters under the right circumstances, but they need to play off some of the saner, more realistic characters. An episode with Jim and Pam only appearing on speaker phone, and with Michael, Dwight and Andy operating largely on their own, led to a lot of forced, wacky antics. And because the mafia storyline(*) was so unrelentingly goofy, I didn't even really enjoy Kevin's subplot, because it felt like more of the same, rather than a contrast to something a little more human-scale. (*) Complete with Hey It's That Mafia Guy Mike Starr, whom I'll always love for having been part of "EZ Streets." Looking forward to PB&J's return, but this was not a good one. Unfortunately, it felt like the Office writers were simply killing time until Jim and Pam came home. totally right, I found myself not being able to pay attention during the episode. For the sake of food service employees, I hope that thing doesn't catch on where you threaten to send your order back. Totally agree. The B story of Kevin screwing up their credit card was way funnier than the main story. Unless they plan to run the other side of that story-- the Jim and Pam honeymoon side-- in a future episode, it was a big missed opportunity. But at least we got to see another episode where Michael convinces himself of something that no functional adult would ever believe! I spent 30 minutes thanking the heavens that I have the return of Pam and Jim and the exposition of Michael's relationship with Pam's Mom to look forward to next week. Swing and a miss, but it happens to the best. I'm trying to remember a worse Office plot than the Mafia thing, but one doesn't come to mind. There were just no laughs at all. It was like a comedic dead zone. As a long time reader of this site, I always laugh whenever Alan says he didn't particulary like the episode because the first 10 or 15 comments ALWAYS happen to agree with him. I agree with Alan a lot, but geez ... I thought it was a funny episode. I laughed out loud three or four times. Was it needed in the overall arch of the story? Nope. But out of 22 episodes or whatever, not every show is going to move the plot forward. Clearly, you haven't read my review of "The Generalissimo," among many others where I've swum against the tide of the readers. That's why they call it murder, not muckduck. There was another one, but I can't remember it right now. Not the best episode, but worth watching. I completely agreed with Alan about "The Generalissimo," but I found this to be a bit funnier than the consensus seems to be here. I thought it was pretty funny. You knew it would be "silly" from the start with the Mafia thing, but there were some laughs in there. It didn't have all the touchy/feely emotional "awwww" moments of the Jim/Pam episodes, but it wasn't bad. After the terrific wedding episode, I knew the followup would be a letdown and I was right. I enjoyed the Kevin subplot a lot more than Dwight, Andy and Michael. I did like Andy pretending to be a car mechanic though. The payoff to that was predictable, but funny. Alan, did you see that you made the main page at Fark.com? Cool! I kinda liked the episode. Didn't love it, but they're using Kevin more, and that makes me happy. Also, my TiVo episode description included a subplot of Erin ruining one of Pam's paintings. Wonder if that gets repurposed. To be honest, I was actually glad to have an episode without Jim/Pam drama which just frankly hasn't been all that interesting since its become kind of cliche at this point. Letting the patients take over the loony bin was a fun change of pace because now we see what happens when Michael goes unchecked. Why did they have to write Jim/Pam out of an episode? They could have picked up next episode after their honeymoon. Was it budgetary to write two regualrs out of an episode? Kevin's line about usually being quick on his feet was great, as was his initial reason for going into Jim's office. 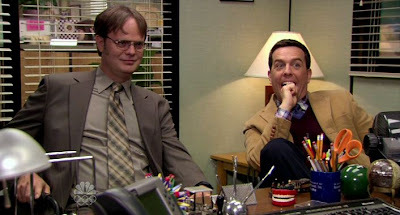 I enjoyed it okay - wasn't one of their best, but there were some funny moments, and I like seeing Dwight and Andy working together, as well as the continued changed dynamic between Dwight and Michael. Frankly, I wish they'd left the Jim & Pam on the phone bits out. Kevin cancelling the credit card was hilarious, but Pam was pretty rude to Oscar on the phone. I'm not one of those who thinks Pam growing a backbone has made her unlikeable, but last night I was forcibly reminded of one of Karen's last talking heads: "Pam is-- kind of a b*tch!" I also a) have finally gotten tired of Ryan (being that rude to Michael in the meeting - like, kid, what have you done? Be glad you've got a job!) and b) would really like to see a Phyllis-centred story soon. Feels like we haven't heard much from her in a while. Yeah, I'm usually an uncritical viewer, but last night was just not funny. I agree with Russell above that NOBODY would believe that the insurance dude was mafia, and the back and forth way that Dwight and Andy were coming at Michael about it was just ridiculous. I'm with AJ Wiley - this might be my least favorite office episode ever. I thought that Kevin's storyline was the only redeeming part of the episode, but this was the first episode in a LONG time that I just didn't like. Wow, this episode wasn't a classic by any means and was much broader than they tend to be but I laughed a lot. Kevin: "I started to use Jim's office for farting..."
Jim *crackle* phoney cell phone connection *crackle* prank. Andy setting a stranger's car on fire. I thought that the Michael and the Mafia story was somehow the inverse of the episode where Michael spied on that family-owned paper company. That one showed Michael at his human best, which this was so much the opposite. Wow! I must be on a different wavelength than most everyone else this week because this episode absolutely killed me, particularly the Andy the Mechanic bits, as well as Kevin's overtaking of Jim's office. Guess it just goes to show the subjective nature of comedy. I felt uncomfortable with Kevin taking over Jim's office...like it was the equivalent of what Meredith's son was doing. It was funny at first and then it just got creepy and I found myself being more and more annoyed by his total lack of respect for Jim's space. How is Pam kind of a b***h for not wanting to be interrupted on her honeymoon by a coworker? With a problem Jim could do nothing about? This episode reminded me of "Business Ethics" from last season. Ok, but eminently forgettable. Yeah, I'm on Team Pam in this particular discussion. You don't call co-workers (and ones you're not also close friends with) on their honeymoon unless it's a matter of life or death. I didn't say Pam was wrong for being annoyed, I said she was being rude to Oscar. This is her pal from the Finer Things Club, and she was speaking to him like he was Dwight. It was a really unattractive tone she was using. Not to mention the fact that Jim was the one Oscar was trying to talk to - Jim can't tell Oscar "no" by himself? Under those circumstances, I would be - and have been - that rude. What Oscar did was not cool, Finer Things Club-mate or no. The mafia plot was pretty thin, but I liked how they acknowledged the precarious balance in the office. And I loved Michael's line "So many words coming at me from so many sentences". While I agree with the general negative sentiment, I did think the way the insurance salesman's pitch overlapped with the way mafia guys might be depicted shaking someone down for protection money was a tiny bit funny- be a shame if something were to happen, etc. While the sight of Andy in the mechanic's uniform, and his I only work on motorcycles explanation was kind of funny, I prefer Andy as a more realistic character, than as a lunatic variation on Dwight. You know what would have made this episode much better? He is a calm voice of reason that could have made for a very funny foil to Michael's fears of extortion. some crazy mental justifications by M.Gary Scott,then a forced trip to Scranton for David. Pam and Jim needed to NOT answer the phone after the first call. "That's why they call it murder, not muckduck" killed me. Very funny. Some of you people take it was too seriously and just dont get it. The five families are the five companies of Scranton Business Park. "There's Michael Scott, regional manager of Dunder-Mifflin"
"Paul Faust of Disaster Kits Limited, they call him Cool Guy Paul"
"W.B. Jones of W.B. Jones Heating and Air, grade A badass"
"Bill Cress of Cress Tool and Die, Bill Cress is super old and really mean." I completely agree. The whole season so far has taken a pretty hacky turn, in my humble opinion. This episode was probably the weakest I can remember. The show has embraced a level of zaniness that I am completely uncomfortable with.The mafia storyline was cringe-inducing from the beginning and not the good-cringe that the Office typically delivers. One of Kevin's finest moments. Strongly disagree. I think it makes perfect sense that when the voices of reason are away, chaos would reign in Scranton. I really enjoyed all the push-pull between the Michael-Dwight-Andy triangle. Not a classic episode like last week's, but very funny. And it even had a running theme of identity confusion -- Michael thinks the insurance agent is a mobster, the credit card company thinks Kevin is Jim, that poor woman thinks Andy is a mechanic. Neat how those jokes were tied together thematically. Definitely not the best episode, but it still had quality laughs. I really enjoyed the Kevin subplot (as I usually enjoy anything involving Mr. Malone) and the increasingly annoyed Jim and Pam over the phone were a lot of fun. Andy's adventures as a mechanic also brought a smile to my face. I think the real issue of this episode is that the "reasonable" characters were gone, but not because they show can't be funny without them. It's more because the idea was too broad and wacky to play without them. If the episode had revolved around something smaller and more realistic (and completely inter-office) than a "mafia connection," I could see it playing out better. I think the idea of focusing an episode on what happens when Pam and Jim aren't around to keep people like Dwight and Andy in check is a good one, but the execution wasn't all it could have been. A more interesting way to do it might have been to focus more closely on Oscar's point-of-view with the Michael-Dwandy stuff happening more in the background. It would have been a lot more funny if we had imagined, say, the dinner meeting with those three and the insurance salesman. Then they could have also given the Kevin subplot more attention. The deleted scene with Erin was the best part of the episode. Andy and Dwight were great, but any time these characters are in the spotlight I am happy. Overall I didn't care that much for the episode. I thought it was a funny episode and loved all the oneliners. I really didn't miss PB&J and it gave the other characters a chance to shine. Thinking about it more, the mafia storyline didn't work for me because it felt like something that should only happen when Jim is around. It felt like something where Jim would've been the one who convinced someone the guy was a mafia guy, just to amuse himself. So it felt off that it all went down without Jim there. Despite Oscar's thinking that it wouldn't have happened if Jim were there. (Does the general office not notice Jim is constantly in on shenanigans like that? Or is the assumption that Jim is all business since the promotion?). I was heartbroken by that deleted scene. Giving Erin a talking head is sacrilege. Almost as unforgivable as Blackmail. Creed's line, as usual cracked me up. Michael talking about "small talk" and Creed saying they could talk about "peas, bb's, dimes." I had some laugh out loud moments and agrees with those who say insanity reigns without the voices of reason. I'd bet good money this was a plotline that's been sitting on the wall of the writers room for a couple of seasons, and they finally ran out of better ideas. There were no ties to the serialized storylines, other than wedging in Pam and Jim being on their honeymoon. "Muckduck" saved it from being a total loss. First Curb Your Enthusiasm was vitrually laughless, now the Office doee the exact same thing. I will have to say I laughed pretty hard when Michael tried to order gabagool at the restaurant. Clearly, his knowledge of the mob comes from The Sopranos and Tony's favorite cured meat. Very hilarious, almost inside joke. I thought this episode was pretty funny. I prefer the goofy ones over the touchy feely emotional Jim-Pam episodes. It's a comedy. I like to laugh and I laughed a lot. I guess Oscar was right - the office is too wildly unbalanced when the sane people aren't there. I watched it, but already I can't remember much of anything about the episode. Huge, huge miss. This episode was a snoozer! Only laugh-inducing moment: Michael asking Jim for advice, and Jim pretends that the connection was bad. The subplot of Erin ruining one of Pam's paintings was cut from the episode and is the focus of the deleted scenes at NBC.com. So far, they've released 2 clips. While it will definitely be forgettable in the grand scheme of things, I definitely laughed quite a bit at it. I enjoyed it much more than most of the posters. Though, with no Jim or Pam, the writers probably should have tried to tell a more human story about Michael. It took me a while to sum up how I felt about this episode beyond the baseline view "it wasn't terrible, the material with Kevin was fantastic, but the A story didn't quite work and the physical absence of Jim & Pam was glaring". So here goes: "Mafia" doesn't entirely work because the salesman storyline relies on Michael being convinced to be paranoid and stupid by Dwight and Andy, and then to be "cured" of his delusions by them. If Michael had felt after the initial meeting that he was being threatened by the mob and worked the rest of the episode from that point, the story would have been A) funnier and B) more believable. The main point of the Michael-Jim interactions over the years has been Michael either having odd, goofy, and oft-stupid ideas and Jim having to either work around them or talk his boss down from them; having it reversed didn't feel true to Michael, Andy or even Dwight. So even though there was funny material around the sides of the story--especially Oscar's spot-on view about the coalition of reason and Toby offhandedly agreeing that he no longer gives a damn what's going on at the office--it was too flawed at its center to be great. On the other hand, Kevin shows again that G-d loves his fools, and I agree with a post I read elsewhere that the only thing missing here was a gag where Angela charged into the office to find him and got a whiff of WHY HE WAS THERE (literal gag, I'd bet). And even though the phone calls were a hamhanded way to have JK and JF present-if-absent for even one show, I did laugh when it was became clear Jim was faking the phone problems to get Michael to shut up and leave him alone. If Oscar, Jim and Pam make up the "Coalition of Reason," does that make the rest of the office the "Legion of Dolts" or something? I enjoyed the episode, although my expectations for The Office have gotten quite low. So that may have been a factor. As someone stated above, I think my favorite moment was, "Oscar said I've checked out mentally? Meh ..."
I laughed at quite a few things, and I enjoyed not having Jim and Pam there, actually. "gabagool" alone was worth the entire episode! that was hilarious! and Michael saying if his SIDE salad comes on top, he'll send it back! LOL! I found this episode a huge improvement on the rest of the season, which has felt flat and directionless. The wedding episode was particularly bad - just too unfocused, full of jokes and stories that went nowhere, whereas at least "Mafia" had some coherent stories, and most importantly, made the most of Dwight and Andy, who have not featured enough this season. And the Kevin story was brilliant - "I think you should let the criminals use the card a little longer"... I loved it! And as a Sopranos/Godfather/etc fan I liked the mob references, and once again the message - this guy was a good salesman - linked to Michael's lesson on good sales techniques at the beginning. All in all, well done! I was amused by Toby's checked out reaction to being told he's checked out. I'd go with Legion of Dumb. I'm pretty shocked at the negative reactions to this show. After the forty-minute parade of gooey shmaltz that was the way-too-long wedding episode, I couldn't wait to get back in the office for a little normalcy. And this was classic hi-jinx a la Season 2 -- Michael being an idiot, and everyone else either enabling him or being frustrated. Michael: (trying to look intimidating) I'll have the spaghetti, with a side salad. If the salad is on top, I send it back. Also, how about that brilliant cold open? Toby getting up to go even before Michael predictably told him to "get out," or Creed's ridiculous conception of acceptable subjects of small talk ("small things... peas, ball bearings, dimes? ").